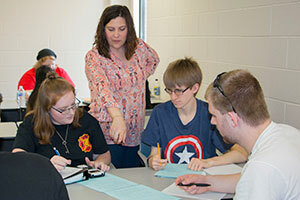 To help students successfully learn algebraic formulas, MCC math instructor Heidi Boring created an activity related to mortgage refinancing. When teaching a statistics lesson, she challenged her students to debunk pseudoscientific claims of psychic powers using mathematics. With her enthusiasm, sense of humor and high-energy presentation style, Boring encourages students to reach a deeper understanding of mathematics. Going beyond simple textbook problems and using real-life examples and creative activities has been her mantra for the past nine years as a full-time instructor at McHenry County College. Her commitment to students and colleagues has earned her the distinction of being selected MCC’s nominee for the Illinois Community College Trustees Association (ICCTA) 2018 Outstanding Full-Time Faculty member award and MCC’s Full-Time Faculty of the Year for 2018. “I love teaching because, every day, I have the privilege to aid students in their journey to become a better person through education,” Boring said. “I also have the privilege of advising some of the best students on campus,” she said, referring to her role as co-advisor of MCC’s Chapter of Phi Theta Kappa honor society. As faculty co-advisor for the Chi Upsilon Chapter of Phi Theta Kappa honor society, she takes on leadership positions at the regional and international level of Phi Theta Kappa, continuing MCC’s tradition as a leading chapter in the Illinois region. Recently, she was selected to serve as a 2018-2019 Faculty Scholar, a prestigious, competitive award. She also serves on the Illinois Articulation Initiative (IAI) Math Majors panel, helping to approve courses for articulation at Illinois colleges and universities. In addition, Boring has served on MCC’s E-Portfolio committee for two years, which entails evaluating graduation E-Portfolios from students. She also served as a member of the MCC Textbook Cost Reduction ad hoc committee and was part of a team that developed instructor resources to accompany a free textbook for MCC’s developmental level algebra course. She earned her bachelor of arts degree in dual majors in mathematics and education from Lake Forest College and her master of arts degree in mathematics education from DePaul University. I love teaching because, every day, I have the privilege to aid students in their journey to become a better person through education.